In brief, you should know the following about us: We have made several changes to our park that include new managers and a new building that houses our office, laundry and bathrooms. We offer overnight stays as well as weekly and extended rates. 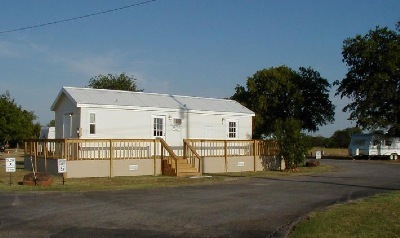 We are located in Sanger, TX, with easy access just off I-35 at exit 479. We are between Denton and Gainsville, TX. Both of these cities offer major shopping, restaurants and entertainment. Dallas and Fort Worth metroplex are approximately 45 miles to the south and offer a large variety of choices that includes sports, such as the Dallas Cowboys, Dallas Mavericks, Texas Rangers and the Texas Motor Speedway, fine dining, entertainment, museums, and parks. Winstar World Casino is just to the north across the Red River. For the fishermen we are a short distance to beautiful Ray Roberts State Park. For those traveling with pets, we welcome them as family.